Food for millions has passed through the grain elevators of the Port of Buffalo, site of the greatest concentration of grain storage capacity in history. 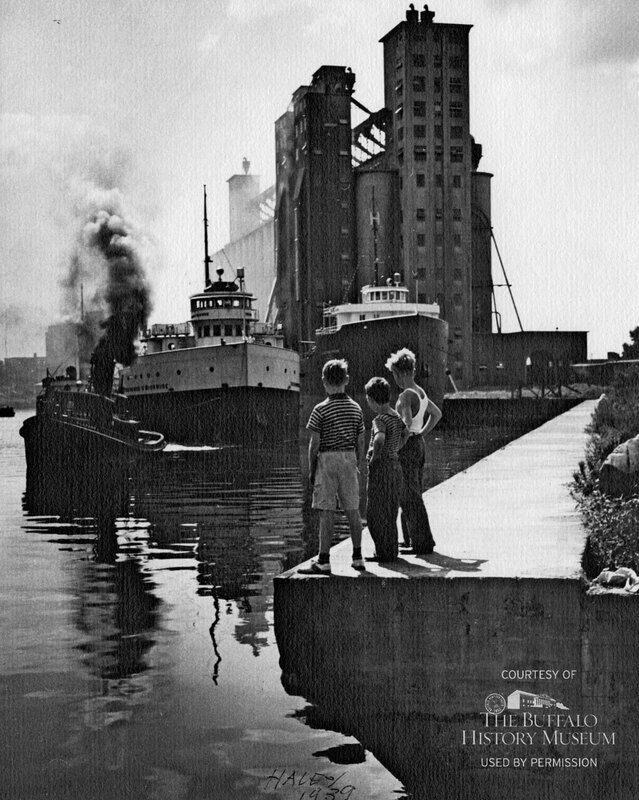 Here, looking west from the foot of Hamburg Street in 1939, a group of Old First Ward boys looks out onto the Buffalo River. Inward bound, a lake freighter is assisted by a harbor tug. Behind is the Standard Elevator, built in 1928 by Hecker-Jones-Jewel Co. and acquired by the Standard Milling Co. the year this photo was taken. After its 1941 expansion, the Standard had a 5.1 million-bushel capacity and could move 40,000 bushels an hour along 1,278 feet of dock. At the time, Buffalo was near the peak of its reign as the greatest grain-distributing port and largest milling city in the Western Hemisphere, with 21 waterfront grain elevators and a total storage capacity of nearly 45 million bushels. The 1959 opening of the St. Lawrence Seaway virtually eliminated Buffalo’s role in grain transshipment. The Standard, operated by Chicago-based Archer Daniels Midland (ADM), is one of the few local elevators still active today.